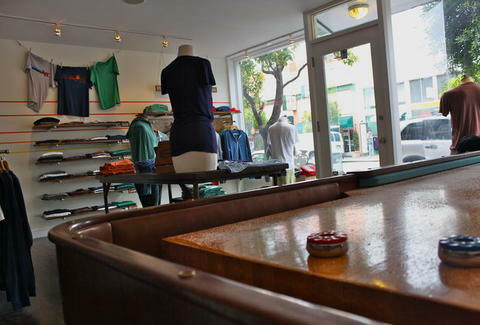 From two dudes who've been selling super-soft (they call it a cross between "angel wings and baby seals"), crazy-good-fitting shirts for over a year now, ML turns its Chestnut pop-up into its first full-time shirt-porium starting today, with an above-average-sized-bedroom interior that includes a playable 12-foot shuffleboard table and super sweet found props, like wood tennis racquets, used camping coolers, and an old set of lockers, which came pre-stuffed with Bayside nerds. Thread-age includes tees like the less-than-full-blown-v-neck Introductory V; polos like the Bjorn McAgassi, which boasts a multi-colored chest stripe on white with a 70s tennis player caricature over the left breast; and their just-launched Afternoon Hoodies, made with a custom-milled blend of recycled beech wood, proving that even when beech wood's aged, it can still have new life. To ensure a perfect fit, all of the wares are available in way more sizes than you're used to (7) using ML's proprietary sizing system which includes "half sizes" labeled smedium, marge and larger, also what Kirstie Alley says every time the butcher brings out a new side of beef. If you're too large to make it down to their storefront, but afraid to buy something online, you're a weirdo, but they actually still have you covered with their cop-a-feel fabric mailer -- basically a swatch of their shirt you can test out to see if you like it, also God's rationale when he stopped making everyone marry their high school sweethearts.